Gaisumov fled Grozny with his family during the Russian occupation in the early 2000s. 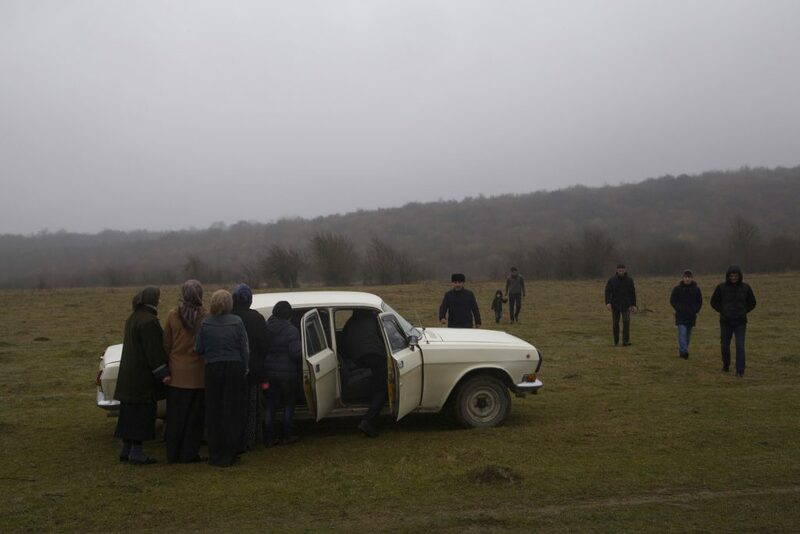 This semi-autobiographical video involves a misty field, and Chechnyans (mostly Gaisumov’s own extended family) walking calmly but with purpose toward a car. First one and two at a time, and eventually by the dozen, families climb into the car. It’s both a literal and metaphorical demonstration of the compromising discomforts of departure from one’s homeland, and implicitly refers to the challenges of a proper assessment of the numbers of displaced peoples. The car they travel in, the “Volga”, is a relic of the Soviet era administrative class (the nomenklatura). It’s an icon that recalls the aspirations of a better country, and regional unity, but also a failed attempt. In the US and elsewhere, the scene suggests clowns piling into a tiny car at the circus. This may refer to the humiliation of fleeing, or the fact that the people of the Caucasus have been historically de-humanized by the Russians as inferior. Young Chechen artist Aslan Gaisumov’s artworks are an opportunity to understand events of his personal life and the recent history of his people. By endowing his war memories with an art form the artist strives to critically and emotionally distance himself from the events of the last two decades and to find an intuitive and poetical language for their description. His works, which include both created and acquired objects, are a testimony of violence, a gaping void left by the war.